Narcissus Rouse came to Wiregrass Georgia when she was a little girl. Her father was Joshua W. Rouse and her mother was Sarah Monroe, the Monroe name being a pioneer family of the Tar Heel State. When she was six years old she came with her family from Wilmington, North Carolina by boat to Savannah, Georgia, then by train to Valdosta, GA, and by ox-drawn wagon to the area of Hahira, GA where they settled in the Bethany Community. Narcissus Rouse married Bryant Miley on December 26, 1901 in Lowndes County, GA. The groom was of medium height and build, with blue eyes and black hair. Bryant Miley was a farmer and merchant of Hahira. He was born April 22, 1881, a son of James B. Miley and Laura Etta A. Webb. His father was a prominent farmer and mill man in the Hahira District; the James B. Miley place was six miles above Hahira. 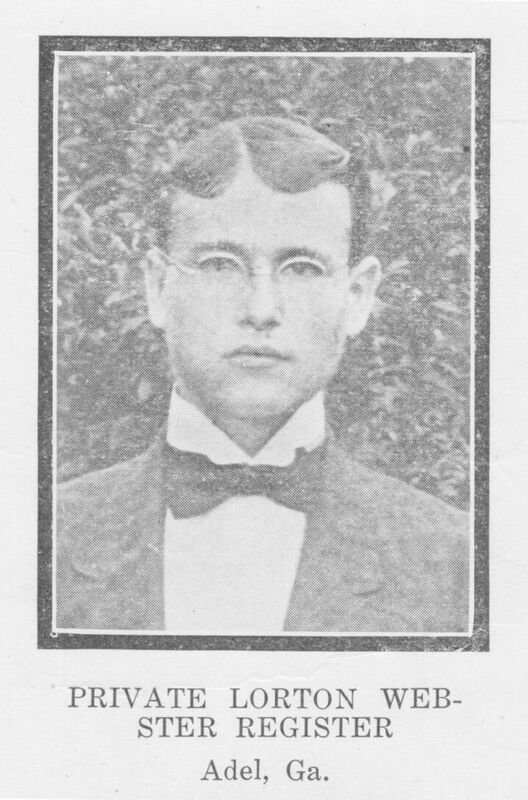 His brother, Lucius Miley, was an agent for the Georgia Southern & Florida Railroad who in 1896 disappeared for a week in an apparent abduction. Another brother, Grover Cleveland Miley, was a proprietor of the Hahira Drug Company and secretary to the Board of Education. In 1910, Bryant L. Miley and his brothers were working in Hahira. Bryant was a hardware salesman. James R. Miley was a grocery salesman. Cleveland Miley was managing his drug store. Lucius Miley was working as a lumber inspector in Milltown, GA (now Lakeland). Bryant’s uncle, Remer Young Miley, was a house carpenter in Hahira. In 1918, Bryant L. Miley was employed as a mail carrier on a rural free delivery route for the U. S. Government. His brother, James “Jimmie” Miley, was constable of Hahira. By 1920, Bryant L. Miley went into business for himself, opening his own store in Hahira. In the 1930s B. L. Miley’s health declined from hypertension and kidney failure. In June of 1940 he suffered a cerebral hemorrhage and died at 5:00am on June 17, 1940. He was buried at Shiloh Church, Hahira, GA. The burial was performed on June 19, 1940 by the Hahira Hardware Company. The Rays Mill Public Service Company was formed about 1912 to provide local public utilities services, including electric and telephone service. The week of December 2 to 9, 1916 was celebrated throughout the country as America’s Electrical Week. During this time electricity and electrical goods were in the spotlight to an unusual extent. Thousands of manufacturers, dealers and agents in every state of the Union were booming the celebration. December 2, 1916 was the first time the Statue of Liberty was illuminated. The Western Electric Company celebrated the big week. Coincidentally, the Western Electric News, December, 1916 edition included a note about the Rays Mill Public Service company. Despite its name, the Rays Mill Public Service company apparently first offered service in Hahira, GA. The article below indicates that the company established electrical service at Hahira in 1912 (Electrification would not be established in Ray City until 1923). The company was proud of its record of uninterrupted service in Hahira and of the fact that its power plant was so simply designed that it could be operated by an illiterate. Rays Mill clipping from December, 1916 edition of the Western Electric News. “We have a record with our plant that I am certain very few others have, and that is – we have never had a “dark” night since. Mr. Pinch turned the juice on something like three or four years ago – and furthermore we have never had a man that run our plant that we paid more than $50.00 per month, and he is now running it and cannot read his own name in print! Now if that is not some RECORD for Western Electric goods I will that some man to trot out one better. The company was later renamed the Ray City Public Service company. Glen Hilton Putnal was born July 24, 1936, a son of Wayne Putnal and Ellen Gaskins. Glen was the youngest of the Putnal children. He grew up on the Putnal farm on Park Street extension, Ray City, GA. The Putnal farm was about a half mile down the dirt road south from Effie Guthrie Knight’s place and Glen would come up to play with Effie’s neices and nephews. He attended the Ray City School where he excelled in academics. Glenn Putnal, 1953 junior at Ray City High School. Glen Putnal was voted the cutest boy of the Ray City High School Class of 1954. Elinor Grissett was cutest girl. Glen Putnal later returned to the area and practiced dentistry in Hahira, GA. He was active in civics. In 1967 he was president of the Lion’s Club of Hahira, GA. He was a contributor to the Valdosta State College Foundation. Glen H. Putnal died November 4, 1990 in Lowndes County, GA. He was buried at Woodlawn Memorial Gardens, Adel, GA. In was not until after the Civil War that mail service at Rays Mill (Ray City, GA) became available. But the mail was one of the earliest public services provided in the Wiregrass frontier of Georgia and the postal service for the region of present day Ray City stretches back more than 185 years. Access to this early postal service was hardly convenient. When pioneers like Levi J. Knight brought their families to Beaverdam Creek in the 1820s, this area of what was then Lowndes County was on the remote southern frontier. A small frontier community was beginning to grow about ten miles to the east, near the Alapaha River where Lakeland now is, where a settler named Joshua Lee had established a grist mill a few years earlier. Joshua Lee and his brother Jesse had come to the area in 1820 , and in 1821 began using slave labor and free labor to construct a dam to impound Banks Lake for a mill pond. But, in 1825 no postal service had been established at the Lee Mill nor anywhere else in the region. In 1827, when an official post office finally was established, it was situated on the Coffee Road, some 25 miles from where the Knights homesteaded on Beaverdam Creek. Daniel McCranie settled on the Coffee Road on lot of land No. 416, 9th District of present Cook County, according to the writer’s information. It was at his home there that the first post office in Lowndes County was established March 27, 1827, and he became the first postmaster; was also there that the first term of Lowndes Superior Court was held in 1826. The next year 1828, the post office was moved down Little River to a new place called ‘Franklinville’ which had been designated the county seat, and there William Smith became the postmaster. The mail in those days was carried by the stage coach except to those offices off the main lines of travel when it was carried in saddlebags on horseback. 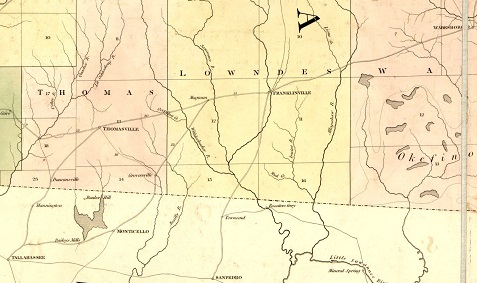 1830 Georgia map detail – original Lowndes County, showing only a conceptual location of Coffee Road, Franklinville, Withlacoochee River, and Alapaha River. The Milledgeville Southern Recorder, May 17, 1828 announced that Hamilton W. Sharpe had opened a post office at Sharpe’s Store, Lowndes County, GA.
Hamilton W. Sharpe announces post office at Sharpe’s Store, Lowndes County, GA. The Milledgeville Southern Recorder, May 17, 1828. A Post Office has been recently established at Sharpe’s Store, in Lowndes county, Geo. on the route from Telfair Courthouse to Tallahassee – Hamilton W. Sharpe, Esq. P.M.
Hamilton W. Sharpe served as Postmaster at Sharpe’s Store until 1836. At that time the name of the post office was briefly changed to Magnum Post Office, with John Hall appointed as Postmaster. …the post office was moved down the Withlacoochee River to the home of William Smith on lot of land No. 50, 11th district of present Lowndes where the court house commissioners had only recently decided to locate the first court house and name the place ‘Franklinville.’ On July 7, 1828, the Post Office Department changed the name of the post office to ‘Franklinville’ and appointed Mr. Smith as postmaster. Postmaster Smith’s annual salary in 1831 was $16.67. The erstwhile town of Franklinville did not exist long – only about four years. At its best, it could only boast one store and three or four families and the court house. The court house was built there in 1828-29, and was a small crude affair, costing only $215.00. The first term of court in it was held in the fall of 1829. William Smith was the first one to settle there, and was living there when the site was chosen. The only other families to ever live there, so far as can be determined were John Mathis, James Mathis and Sheriff Martin Shaw. After a short residence there the three last named moved to that part of Lowndes cut off into Berrien in 1856. Newspaper accounts of the time indicate the courthouse remained at Franklinville at least as late as 1835, when a big Fourth of July celebration was held there. Among the speakers celebrating the “Declaration of American Independence” at Franklinville that day were Levi J. Knight, Hamilton Sharpe, Reverend Jonathan Gaulden, William Smith, John Blackshear, James Williams and John Dees. CHAP. CCLXXI.- An Act to establish certain post roads, and to alter and discontinue others, and for other purposes. In Georgia—From Franklinville, Lowndes county, Georgia, via Warner’s Ferry, to Townsend post office, in Madison county, Territory of` Florida.…From Jacksonville, Telfair county, via Holmesville, in Appling county, and Wearesboro, in Weare county, to Franklinville, in Lowndes county. This post road, built with slave labor, ran through Allapaha (now Lakeland), passed just south of L. J. Knight’s place, and continued west to Franklinville. With a public road established, a stagecoach route went into service from Thomasville, via Frankinville, to Waycross. Detail of J.H. Young’s 1838 Tourist Pocket Map of the State of Georgia showing the route from Waresboro to Thomasville, GA.
Only a year after the clearing of the post roads to Franklinville, it was decided to move the Lowndes county seat yet again, this time from Lowndesville to a new site, named Troupville, at the confluence of the Withlacoochee and the Little River (Map of Old Troupville, GA with Notes on the Residents). November 10, 1841 letter from Samuel E. Swilley to Charles J. McDonald, Governor of Georgia, posted at Troupville, GA and reporting Indian activity in the area. Captain Samuel E. Swilley was a militia leader in the 1836-1842 Indian Wars in Lowndes County, GA. In 1837, the transfer of the post office and Postmaster William Smith from Franklinville to Troupville inconvenienced many residents of north Lowndes county, possibly prompting the resumption of postal service at Sharpe’s Store on Coffee Road. The name of Magnum Post Office reverted to Sharpe’s Store Post Office, and Hamilton W. Sharpe was again Postmaster. H. W. Sharpe re-opened the post office at Sharpe’s Store on the Coffee Road, Lowndes County, GA. Southern Recorder, April 18, 1837. Unfortunately, Sharpe’s Store was even farther distant from Beaverdam Creek; the Knights, Clements, and their neighbors were left with a forty mile round trip to Troupville fetch the mail. Sharpe himself served as Postmaster 1837 to 1848. James Perry took over as Postmaster at Sharpe’s store from 14 December, 1848 to 16 August, 1849, when Sharpe returned to the position. John G. Polhill took the position 5 July, 1850, and Norman Campbell took over 21 August, 1850 to 21 July 1853 when the post office was moved to Morven, GA.
By 1838, Postmaster William Smith at Troupville was receiving weekly mail via routes from Waresboro and Bainbridge, and from San Pedro, Madison County, FL. In 1847 weekly mail was coming and going from Irwinville and Bainbridge, GA, and from Madison, FL. William Smith continued as the Troupville Postmaster until October 30, 1848 when attorney Henry J. Stewart took over. On August 16, 1849 William Smith resumed as Postmaster at Troupville. Weekly service extended in 1851 to Waresboro, Albany and Irwinville, and to Columbus, FL. By the late 1830s, Allapaha (now Lakeland, GA), had grown into a bustling trade center with several mills and businesses. Ten miles east of Knight’s farm, Allapaha was situated at the point where the Franklinville-Jacksonville Post Road crossed the Alapaha River. In 1838 a post office was established there , and Benjamin Sirmans was the first postmaster. Weekly mail service berween Waresboro or Waynesville and Troupville came by Allapaha. While Andrew J. Liles was Postmaster, the name of the town was changed from Allapaha to Milltown, GA.
Another early Berrien post office was located at Flat Creek, about 15 miles north of present day Ray City, GA. This post office was established on August 9th, 1847. At that time, Flat Creek was a growing community located on one of the first roads in Berrien County, and warranted the establishment of a post office. The community center was built largely by Noah Griffin with the aid of his sons and African-American slaves. “At the time of the establishment of the post office there was a saw mill, grist mill, cotton gin, a country store and farm, all owned and run by Noah Griffin and his sons…” The J. H. Colton Map of Georgia, 1855 shows the Flat Creek community situated on Lyons Creek, a tributary of the Alapaha River now known as Ten Mile Creek. 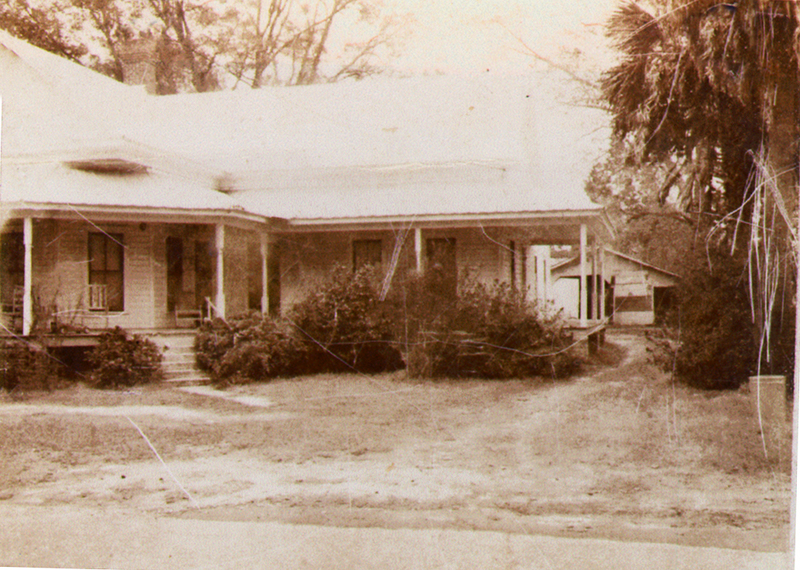 The store at Flat Creek was located on a road that connected Irwinville and points north to the town then known as Allapaha (now known as Lakeland, GA). On May 7, 1852, a post office was opened at Hahira, GA and Barry J. Folsom was appointed as the first postmaster. Randal Folsom took over as postmaster in 1858. The post office at Hahira was closed in 1866, and postal service did not resume there until 1873. When Berrien County was created in 1856, there were still very few post offices in the area. “These were supplied by star routes, the carrier rode horseback.” Prior to 1845, in areas inaccessible by rail or water transportation delivery of inland mail was let out to bid by contractors who carried mail by stagecoach. On March 3, 1845 Congress established an Act which provided that the Postmaster General should grant contracts to the lowest bidder who could provide sufficient guarantee of faithful performance, without any conditions, except to provide for due celerity, certainty and security of transportation. These bids became known as “celerity, certainty and security bids” and were designated on the route registers by three stars (***), thus becoming known as “star routes.” In rural areas, a bidder who could provide delivery by wagon, or even horseback, could win a Star Route mail contract. With the creation of the new county of Berrien in 1856, a public site was selected and Nashville was established as the county seat. The site was near the geographic center of the county and located on the Coffee Road, one of the earliest public roads in Georgia. “Previous to the creation of Berrien County there had been for many years a farm and public inn located at this point on the Coffee Road.” “The new county site had been laid out and christened and stores, shops and eating houses and other industries had been launched, where only a few months before there had been a farm and cow pens.” In 1857 a post office was established at Nashville to serve the new town and the county residents. The early road from Nashville to Milltown passed through the Rays Mill community by way of the residences of General Levi J. Knight, Isben Giddens, and John M. Futch. Although Levi J. Knight’s farm was situated at the midpoint on the Nashville – Milltown(Lakeland) road, it probably became a matter of convenience to post mail at Nashville as that was where the business of the county was conducted. With Secession, the services of the U.S. Post Office were lost to the South and to Berrien County. The Southern Recorder, Dec 29, 1863 reported on Acts passed by the [Confederate] Legislature and signed by the Governor, Joseph E. Brown, which included an act, “Requesting the establishment of a mail route between Milltown and Nashville in Berrien county.” The 1864 Census for the Reorganization of the Georgia Militia shows that A. K. Harmon was then serving as a postmaster for the 1144th Georgia Militia District, which was centered on Ray’s Mill. After the war, Nathan W. Byrd, a Nashville farmer and father-in-law of Matthew H. Albritton, served as the mail carrier on the route between Nashville and Milltown (Lakeland), GA.
After the Civil War postal service was established at the present site of Ray City, GA. The previous post, Posting Mail at Ray City, describes how the grist mill built by General Levi J. Knight and his son-in-law Thomas M. Ray on Beaverdam Creek became the first post station here. David Jackson Rigell ~ First Postmaster of Ray’s Mill? Maybe Not! In the summer of 1911 The Valdosta Times reported that Reverend Robert Payne Fain was seeking souls in Ray’s Mill, now Ray City, GA. Along with Reverend Fain was Miss McCord, who had just come from the Kansas City National Training School for Deaconesses and Missionaries. Rev. R. P. Fain is holding a tent meeting here [Ray City] now. He began Saturday, holding his first service Saturday Evening. Miss McCord, who is just from the Kansas City training school, lectured Sunday afternoon. They had three services today, but only two in the week, at four o’clock in the afternoon and 7:30 in the evening. Born Jefferson Payne Walker (1860-1921) in Texas, it is said he changed his name to Robert Payne Fain about 1883 after being falsely accused of theft. His father was James Carr Walker, a Methodist minister who was one of the original settlers of the community of New York, TX. His mother was Mary Ann Fain. Robert Payne Fain left Texas to attend Emory College in Oxford, GA., and became a Methodist Minister in the South Georgia Conference. 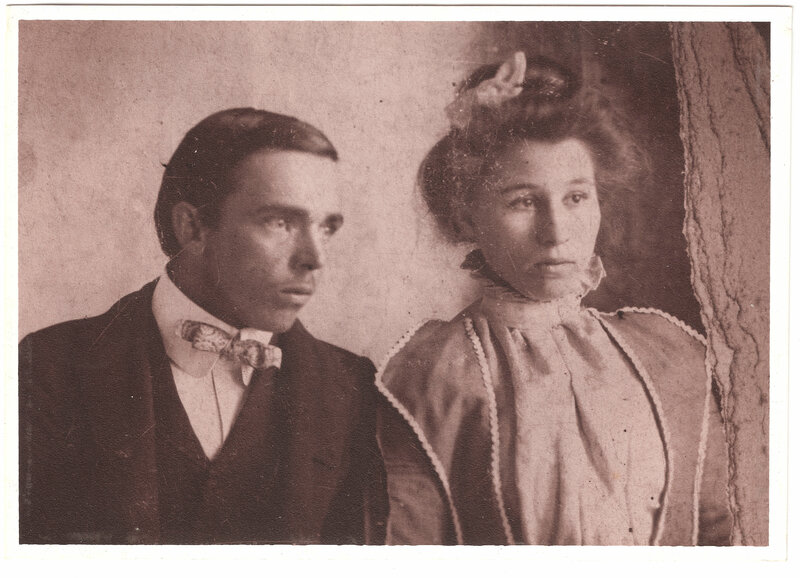 On October 27, 1889 he married Remmie Carolyn Howell in Lowndes County, Georgia. The Fains made their home in the 1300 Georgia Militia District, in present Lanier County. Robert Payne Fain, aka Jefferson Fain Walker, died January 6, 1921 while attending a meeting at Hahira, Georgia. Valdosta, Ga., Jan. 7. – Stricken with acute indigestion, the Rev. 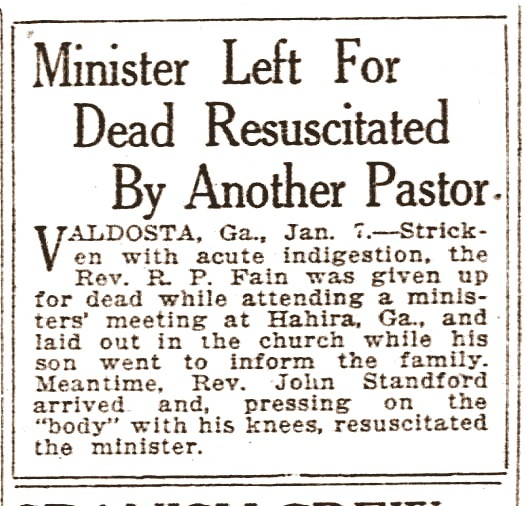 R. P. Fain was given up for dead while attending a ministers’ meeting at Hahira, Ga., and laid out in the church while his son went to inform the family. Meantime, Rev. John Stanford arrived and, pressing on the “body” with his knees, resuscited the minister. Death of Reverend R. P. Fain reported in the Thomasville Times-Enterprise. 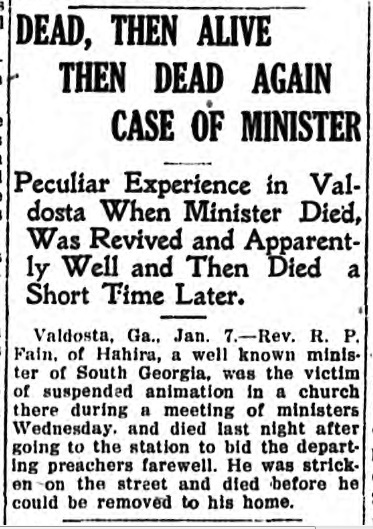 Peculiar Experience in Valdosta When Minister Died, Was Revived and Apparently Well and Then Died a Short Time Later. Valdosta, Ga., Jan. 7. – Rev. R. P. Fain, of Hahira, a well known minister of South Georgia, was the victim of suspended animation in a church there during a meeting of ministers Wednesday, and died last night after going to the station to bid departing preachers farewell. He was stricken on the street and died before he could be removed to his home. Valdosta, Jan. 7. – Rev. R. P. Fain, of Hahira, well known minister of South Georgia, who was a victim of suspended animation in church there during a meeting of ministers Wednesday, died last night after going to the station to bid the departing preachers farewell. He was stricken on the street and died before he could be removed to his home. Mr. Fain was the pastor of the Methodist church at Hahira, and had been very actively engaged in helping to entertain the visiting ministers, comprising all of the preachers of the Valdosta district. About 11 o’clock Wednesday while the ministerial conference was in session, he was stricken. Some of the ministers present saw him tottering and about to fall and rushed to his rescue. They held him up until he was, apparently, dead, then laid him out. In a few minutes his body was cold, his face black, and rigor mortis had apparently set in. His son, Rev Ed Fain, as well as other ministers present, gave him up for dead, and the younger Mr. Fain went to the house to inform his mother of his father’s death. After fifteen or twenty minutes Rev. John Stanford, of Adel, decided that an effort should be made to revive him; so he jumped on the prostrate form with his knees and began to work his arms violently, to see if his respiratory organs would not begin to function. After a few minutes the stricken preacher gave one breath and later on he revived so that he could be carried to his home. Later on in the day he was able to disrobe himself and go to bed. Yesterday morning he was able to return to the church and resume his work among the preachers. It seems that he had a very violent attack of acute indigestion. For about 30 years in the early 1900s Gordon Vancie Hardie was a merchant of Ray City, GA. 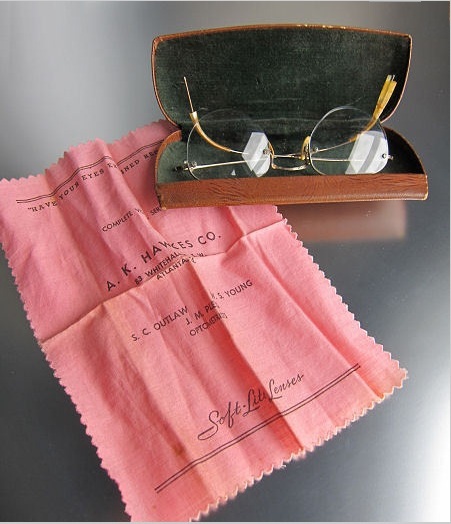 Among his marketing strategies was an arrangement with A. K. Hawkes Company to bring a visiting optician to Ray City. 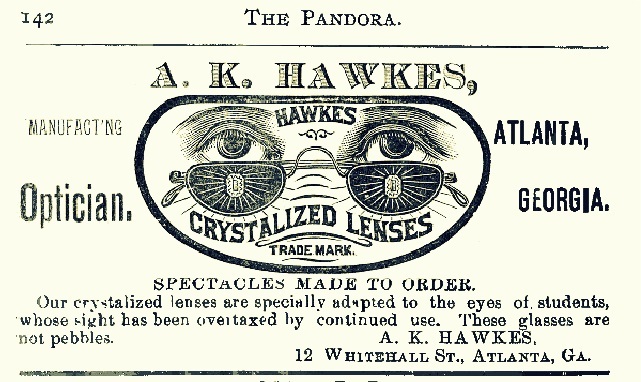 By special arrangement, the firm of A. K. Hawkes, Optician, Atlanta, GA made visits to rural drug stores, like that of Ray City, GA merchant G. V. Hardie. G. V. Hardie ran advertisements in The Valdosta Times announcing this service for his patrons. 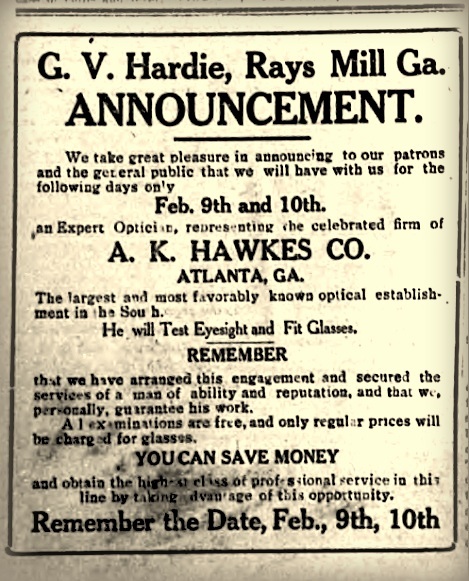 Feb 3, 1912 announcement in The Valdosta Times: G. V. Hardie, Ray City druggist, brings A. K. Hawkes optician to town. 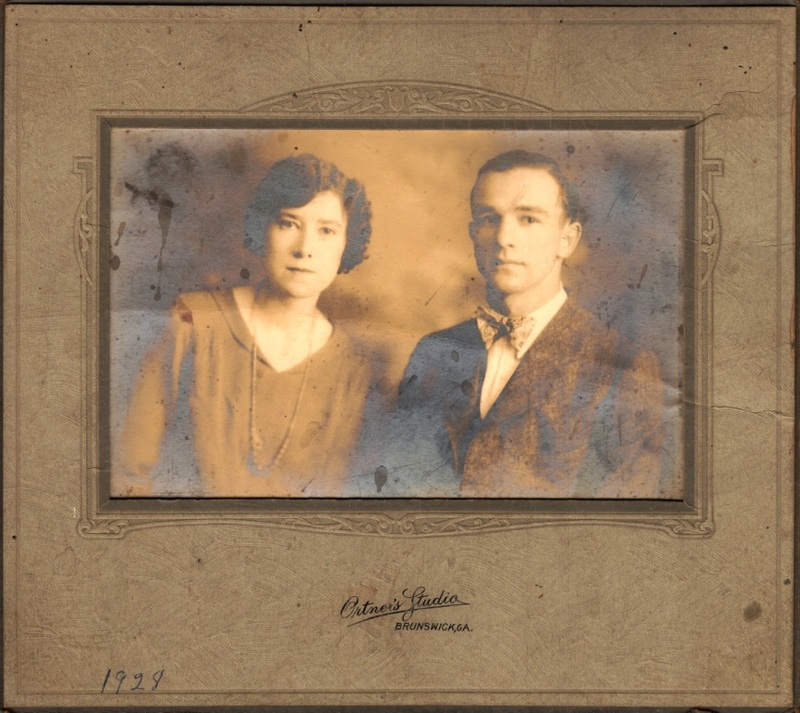 Gordon Vancie Hardie was born in Pinetta, Florida on Tuesday, May 13, 1890, a son of Jessie F. and Lila D. Hardie. Gordon had a brother, Grover, who became a physician, and two sisters, Pearl and Maud. Gordon spent his boyhood days in Florida; at the time of the census of 1900, his family was living in Withlacoochee, Madison County, Florida. By 1910, Gordon’s father had moved the family to Georgia. Nineteen year-old Gordon was living in his parents household in Hahira, GA, where his father had acquired a farm. While his father farmed, Gordon worked as a drygoods salesman. One of the merchants in town was Irvin “Plimp” Hodges. Plimp had spent most of his life farming in Lower Fork, Lowndes County, GA, but some time prior to 1910 he brought his wife and daughter, Addie, to live in Hahira, GA. Perhaps Gordon Hardie met Addie at her father’s store. Somehow they became acquainted and soon enough they were married. 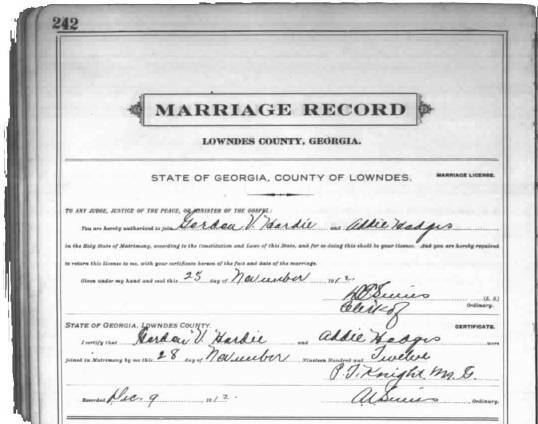 Gordon Vancie Hardie and Addie B. Hodges were wed on November 25, 1912 in Lowndes County, GA. Perry T. Knight, Minister of God and native of Ray’s Mill, GA, performed the ceremony. From about 1911 to his death in 1937 Gordon Vancie Hardie made Ray City, GA his home. He was buried in Beaver Dam Cemetery, Ray City, GA. Grave marker of Gordon Vancie Hardie, Beaver Dam Cemetery, Ray City, GA.
Lorton Webster Register of Ray City, Georgia. KIA, WWI. Lorton Webster Register, of Ray City, GA entered World War I military service as a private in 1917. Lorton W. Register was born in Hahira, GA about 1892, a son of John R. Register. His early childhood was spent in Hahira. Some time before 1917, the Register family moved about thirteen miles to the northeast to Ray City, GA. During WWI, Lorton went into the Army. The United States declared war on Germany on April 6, 1917 and on April 11 Lorton and his brother, Balley Register, both volunteered for service. Lorton was sent to Ft. Thomas, Kentucky where he was inducted on April 15, 1917. He was 25 years old at the time of enlistment. 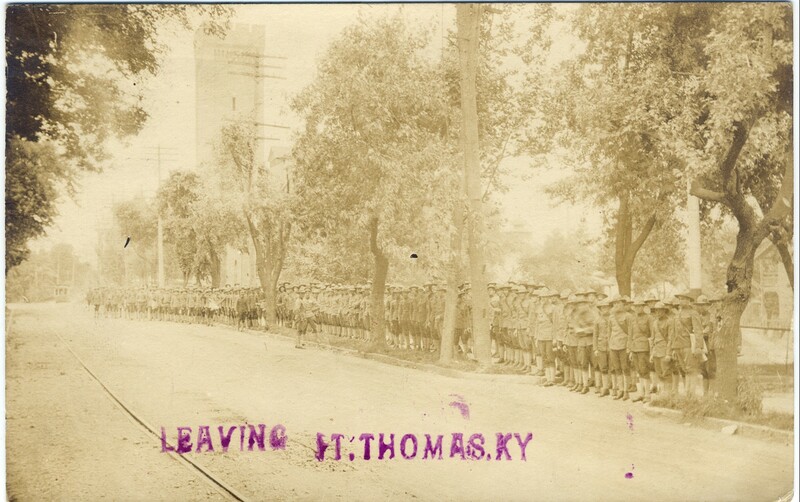 Fort Thomas was designated as a recruit depot. Recruits arrived as civilians and were processed into uniformed soldiers with assignments to official training locations. Company I, 18th Infantry to death. More than a year later it was determined that he had been killed by a shell fragment during action on March 1, 1918. His father, John R. Register, received the official notification of his son’s death at his home in Ray City. The report of Georgia casualties appeared in the Atlanta Constitution. 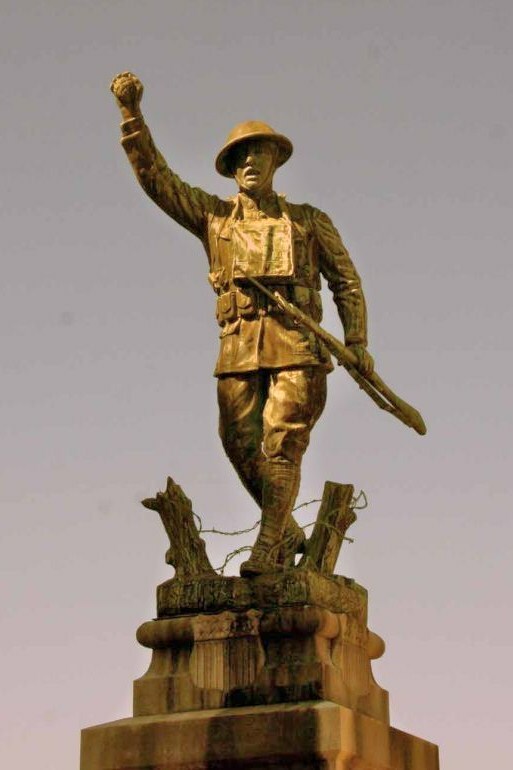 WWI Doughboy Monument, Nashville, GA. The name of Lorton W. Register appears on the base of the monument, along with the names of other soldiers of Berrien County, GA who gave their lives in the war. The names of twelve Georgia boys appear in today’s official casualty list, which contains the names of 527 more American heroes who were victims on the fields of France. The Georgians are, killed in action previously reported missing: Privates Albert L. Carter, Ellaville: Lorton W. Register, Ray City. Privates Dave Akins, Vienna; Elder Grace, Elko. Wounded in Action: Lieutenants George A. Roberts, 451 Center street, Macon; Gardie Nix, 70 North Main street, Gainesville; Sergeants William C. Graham, 521 Lee Street, Atlanta; Jabez P. Kelly, Mystic; Corporal Walter S. Robinson, Waco; Privates Dallas T. Townley, Lawrenceville; Lawrence P. Woolf, Morrow. Died of Disease: Private Elijah Mealer, Cartecay. Lorton W. Register is among the soldiers honored at St. Mihiel American Cemetery, Thiaucourt, France; his name appears there on the Tablets of the Missing. 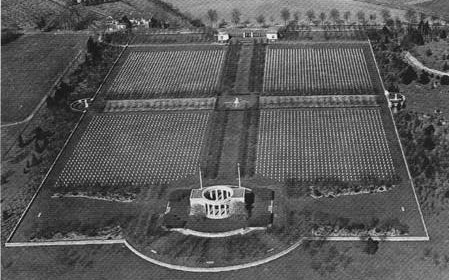 American Cemetery, St. Mihiel, France as it appeared in 1921. Later, permanent grave markers and a monument were added to the cemetery. American Cemetery at St Mihiel, France. The 1920 Report of the Railroad Commission of Georgia reported that the offices of the Ray City Telephone Company were located in Hahira, GA. For the year 1921, the company had gross earnings of $1872.59 and $2359.75 in operating expenses, for a net deficit of $487.19. In 1924, the Atlanta Constitution reported that a Ray City entrepreneur would purchase the Hahira telephone system. Hahira, Ga., March 7. – (Special.) M.G. Melton, of Ray City, Ga., has purchased the Hahira telephone system from the Bank of Hahira, and will assume management at once. The system is comprised of 225 telephones, with rural lines running into adjacent communities, as well as being connected by the Southern Bell system for long distance service. By the time of Melton’s Hahira investment, Ray City also had a well established telephone system. The Rays Mill Public Service company was established some time prior to 1912. By 1919, the Ray City Public Service Company served as the telephone company for Ray City, Georgia. The Report of the Comptroller-General of the State of Georgia for the year ending December 31, 1922 shows that there were no less that 152 telephone companies operating across the state. In the local area, Ray City, Nashville, Milltown, Hahira, Homerville, Cairo and Quitman all had telephone companies. It is said that the first telephone in Ray City was installed at the drugstore that later became the Victory Soda Shop. 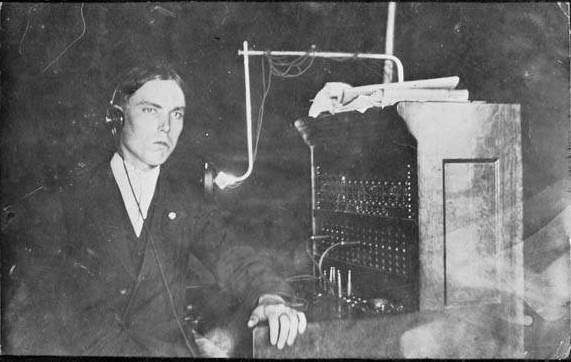 Ike Fender and Gillie Ann Cowart were among the town’s first telephone operators. By 1922, the Ray City Public Service company had 16 miles of telephone poles and 75 miles of telephone wire. The company paid $9.50 for telephone company taxes, and the total value of the company property was $1,900.00. In the Report of the Comptroller-General of the State of Georgia for the year ending December 31, 1925, the company name is given as Ray City Telephone Company. The total value of the company property was $1,888.00, and the company paid $9.44 in state taxes. Later, M.G. Melton relocated to Hahira, but continued his commercial investments in Ray City. An earlier post told of his intention to operate a telephone exchange in Ray City. M.G. Melton Buys A. Turner Brick Bldgs. A transaction of much interest to the people of Ray City and surrounding community is that in which Mr. M. G. Melton of Hahira purchased the two large brick buildings known as the Andrew Turner Buildings. One of the buildings is two stories high and the top floor is needed for the telephone exchange. In the 1930s, the Civilian Conservation Corps assisted with the construction of rural telephone lines. Eventually, the larger telephone corporations bought out the local exchange operators. In 1950, the telephone service in Ray City was provided by Consolidated Telephone Company, which also served Berlin, Boston, Coolidge, Doerun, Hahira, Lakeland, Meigs, Morven, Moultrie, Norman Park, and Pavo. Addie B. Hodges was born March 15, 1889 in Lowndes County, GA. When she was a young woman, she moved with her family to Hahira, GA. Her father, Irvin “Plimp” Hodges, was one of the merchants in town. In the mercantile business he probably had contact with salesmen in the drygoods line; salesmen like Gordon Hardie. At any rate, Addie and Gordon became aquainted and, by and by, they were married. Gordon Vancie Hardie and Addie B. Hodges were wed on November 25, 1912 in Lowndes County, GA. Perry T. Knight, Minister of God and native of Ray’s Mill, GA (nka Ray City), performed the ceremony. It seems that by the time they married, Gordon had already moved to Ray City, where he had gone into business for himself. Rays Mill was well represented at the carnival last week. Misses Annie Mae Carter, Margie Dasher, Pearl Hardie Knight, Mr. and Mrs. G. V. Harvie, W. H. Luckie, George Norton, J. J. and J. S. Clements and C.B . Shaw were among the visitors. The year 1919 was a difficult one for the Hardies. That summer, they lost an infant boy. The babe was buried at Beaver Dam Cemetery, Ray City, GA. Sometime after 1924 the Hardies purchased a big white house with a high roof, on the north side of Jones Street on the block between Ward street and Samuel Street. The house was originally built about 1917 for Rachel and Francis Marion Shaw (See Francis Marion Shaw Historical Site by Brian Shaw). The Hardies occupied the house for many years. They kept a big garden on the lot west of the house, on the corner of Ward and Jones Street. 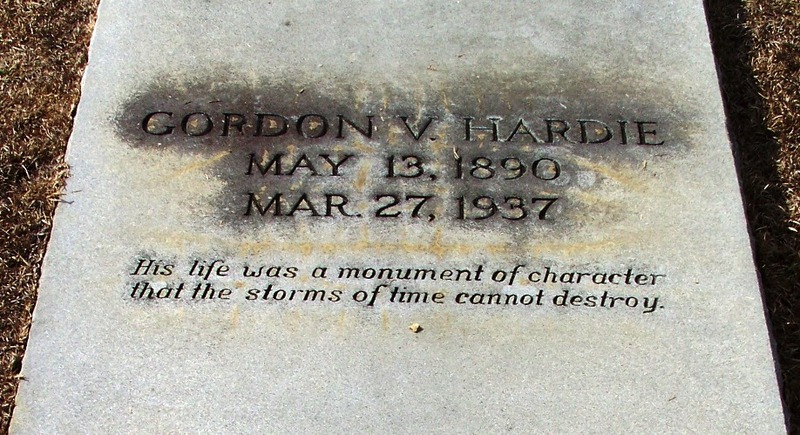 Gordon Vancie Hardie died March 27, 1937 at just 46 years old. He was buried at Beaver Dam Cemetery, Ray City, GA. In the 1950s, the widow Addie B. Hardie was a dear friend and neighbor to Lessie Guthrie Futch. Lessie and Rossie Futch lived first in a small house next door to the Hardies on the east, then after 1951 directly across Jones Street, opposite the Hardie residence. Addie Hardie was a frequent visitor to the Futch home. Most afternoons, Mrs. Hardie would cross the street to visit with Lessie, and to have one of Lessie’s hot baked biscuits. When Lessie’s daughter happened to be visiting, she would do Mrs. Hardie’s hair. Addie Hodges Hardie died October 9, 1972. She was buried next to her husband at Beaver Dam Cemetery, Ray City, GA. The Shaw/Hardie house on Jones Street was destroyed by fire in 1972, and the car shed seen in the background in the photo above was demolished in 2010. The lot where they stood is still vacant. The Hardie’s big garden is now occupied by a modern brick house. John David Miley, of Hahira, and Lessie Lee Guthrie, of Ray City, were married February 24, 1926 inValdosta, GA. They were married at Christian Parsonage by Reverend Richard Wallace. Mrs. Wallace served as the witness. Lessie Guthrie was raised in Ray City and spent most of her life here. Her ancestors were among the pioneer families that settled Berrien County, and many of the Guthrie family connection still reside in the Ray City area. Lessie Guthrie Miley and John David Miley, 1928, Brunswick, GA. Following their wedding, John D. Miley took a job at the A & P Grocery, in Waycross, GA. At the first opportunity, though, he took the Civil Service Entrance Exam, and got a position with the U.S. Postal Service working at the Post Office in Brunswick, GA. Thereafter, John D. Miley worked with the postal service the rest of his life. Even when he served in the military, his service was in mail delivery. Personal mention in the Ray City News, Jan 3, 1929. 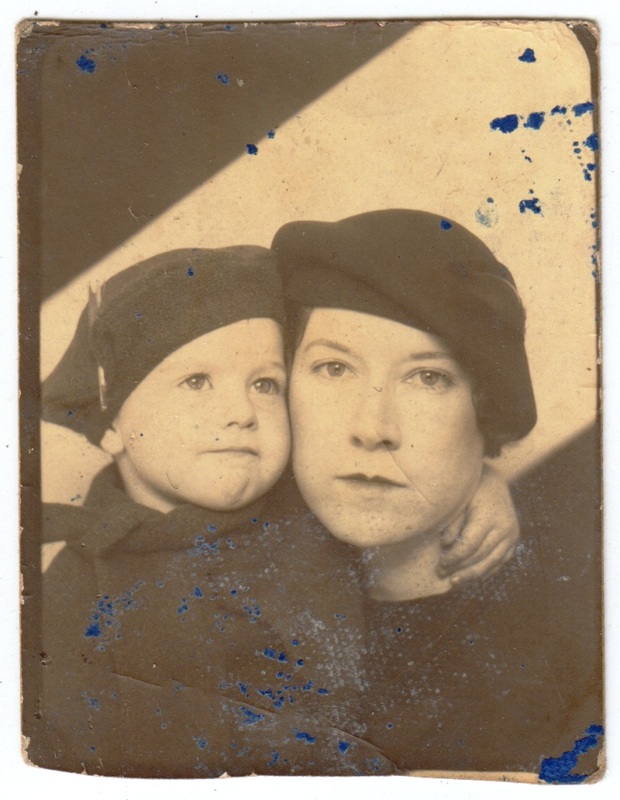 In the early 1930’s John D and Lessie had two children, Diane and David. But by 1935, they were experiencing marital difficulties. Lessie left Brunswick and took the childen to Florida. They lived for a short time with Lessie’s brothers, Sam and John Guthrie, in an apartment in Winterhaven, FL. John D. Miley came to see her, they reconciled, and he took his family back to Brunswick. The marriage of Lessie Lee Guthrie and John David Miley lasted another four years. They separated in 1939 while living in Hollywood, Florida. 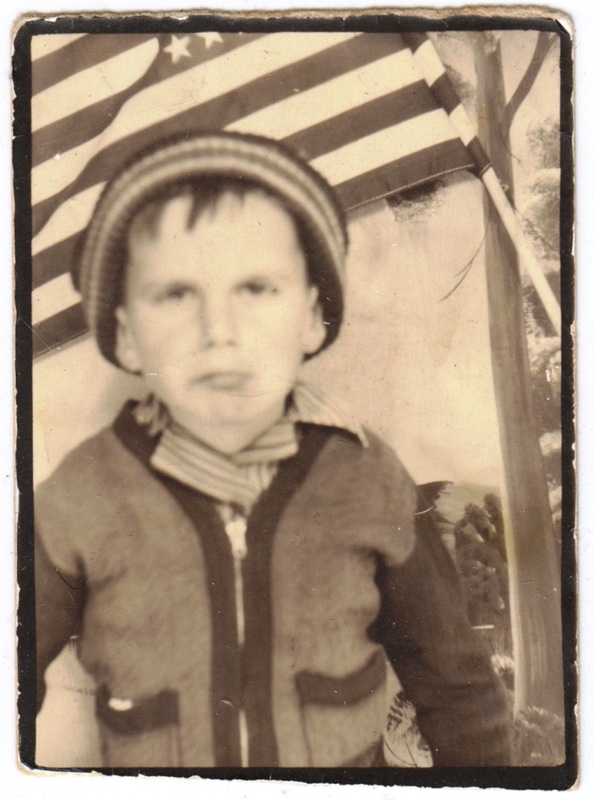 John David Miley, Jr., "David", circa 1939. Miley, came from Hahira, GA to take them back to Georgia. Narcissus arranged for a large railroad crate to be delivered to Lessie’s place of residence. She packed all of Lessie’s possessions, her electric appliances, clothes, everything right down to the doilies. The railroad picked up the crate and they all rode the train together back to Hahira. Lessie and the kids stayed with Narcissus in Hahira about a week. Then June Guthrie, Lessie’s brother, came to get them and took them back to the Guthrie farm on Park Street, Ray City, GA.